Blue is an interesting color â€“ it appears to get richer and darker for a brief spell in the early evening. That is because the eye is more sensitive to blue at dusk, in the half light, when it gains in intensity because the early evening blue light enhances the blue of the flowers. Fortunately blue is also extremely sociable. It mixes well with most other color, the paler shades with grays and whites, the darker ones with green. 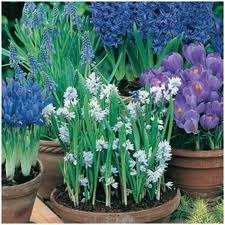 There is a good number of blue plants, from the eryngiums to hyacinths. RIGHT: A highly effective posy of anemones, forget-me-nots, and comfrey.